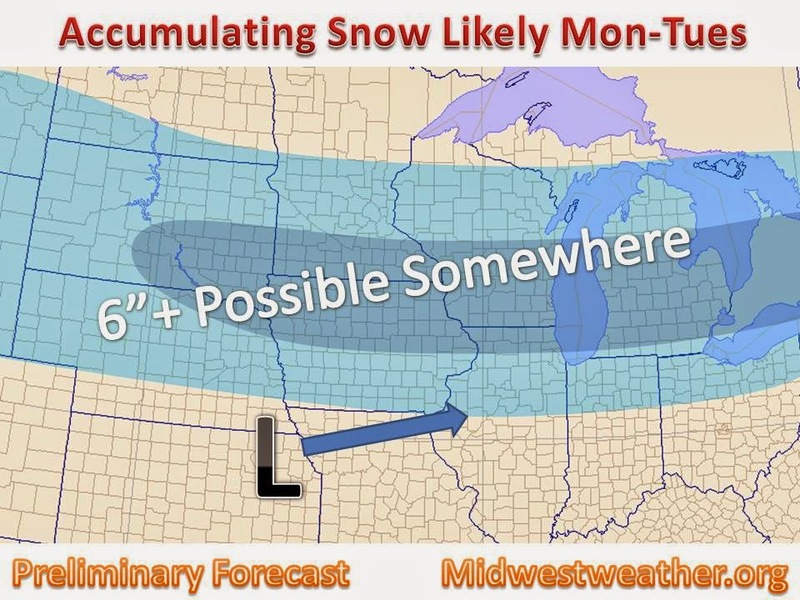 Models have been hinting at the idea of a cross country winter storm impacting much of the Midwest for a few days now, and confidence is on the rise that we will,in fact, see a mid November winter storm. As with any system the track and amount of moisture to work with will be key in the extent of which accumulations occur. 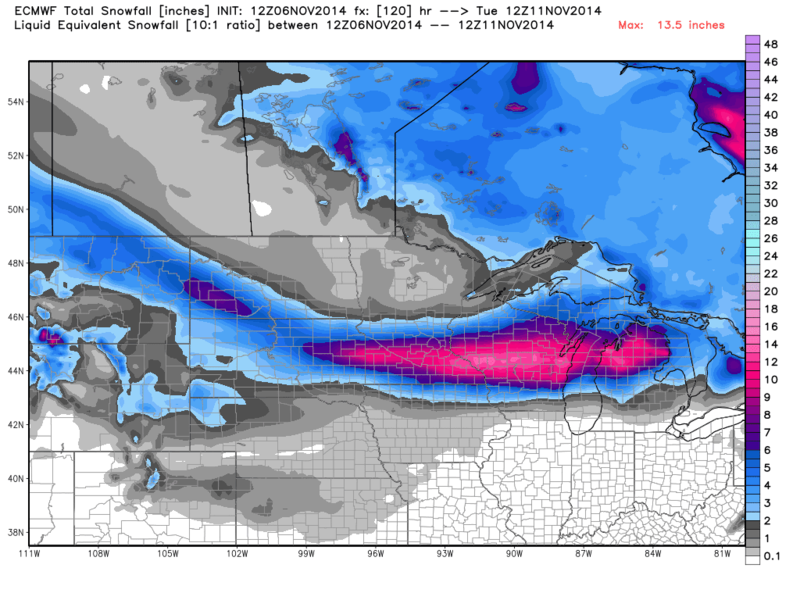 Most of the major medium range models have at least a band of 6-12" draped across the Midwest. The GFS model has the most consistency but is a southerly out-layer, while the ECMWF has the northern most solution, with ensembles even more north. On the left we the the 18z GFS model. It is the weakest and most south out of the major weather models. However, we will start with this particular model becasue it has been showing the greatest run to run consistency. Generally, over the past several runs its plots a narrow band of 4-8" from northern Nebraska to Detroit. However, its ensembles (other runs of the same model with different pertabations) have solutions more northerly. Its consistency cannot be ignored. On the left we have to "best" winter weather model around, the European. It is one of the more northerly solutions, but lacks consistency in recent runs. The european was the first model to latch on to the idea of a winter storm storm next week, and its showing quite the snow accumulation, with over a foot of snow across parts of Wisconsin. Hopefully in the coming days it will stop flip flopping its track and pin down where this likely winter storm is going to end up next week! And finally, the last model that is worth showing, the GEM. It is a candian run model, but is not the most reliable. However, it does take a track that would be a mean to other major models and puts down significant amounts of snow, 16"+. As of now, the track of the system is too tough to pin down, but it does appear that winter will make an early entrance. Official Winter Forecast. Stay tuned for another update tomorrow evening, more questions will be answered by then.